This is a lovely recipe that comes from herbalist Kiva Rose. This is a simple home remedy preparation that is excellent for sore throat, as well as other types of inflammation, including digestive inflammation. 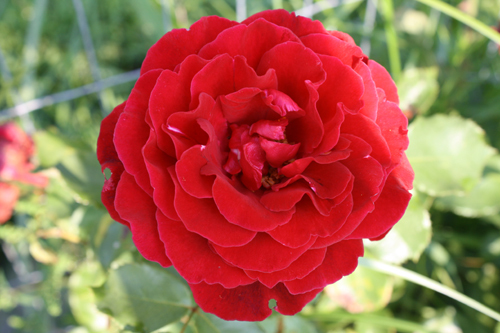 This rose petal elixir is also a good remedy for heart palpitations and other cardiac issues. This elixir can also be taken in very small amounts (like Rescue Remedy) for anxiety and fatigue, and, when used externally, it is a useful herbal remedy for insect bites. 1. 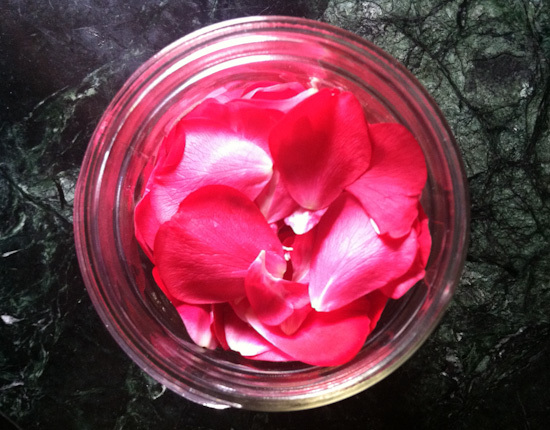 Fill your jar with fresh rose petals. They don't have to be packed down, but they should fill the jar so that there isn't a lot of empty space. 2. If you don't have enough rose petals to fill the jar, you could add some bee balm petals, chopped fresh ginger, zest of orange, lime, or lemon, etc. 3. Next, add honey to coat the rose petals and fill about 1/3 of the jar. Add brandy or other alcohol to the top of the jar. Place plastic wrap over the top and then screw on your metal lid. Allow to sit in a cool, dark place for 3-6 weeks before using. 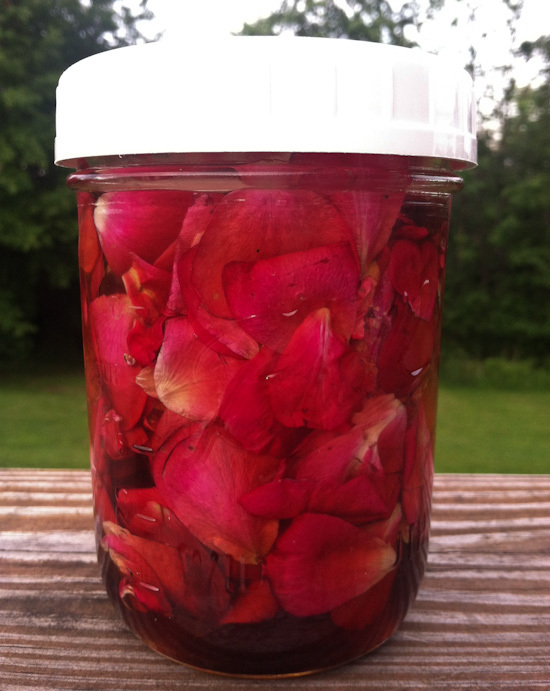 If you don’t want to use alcohol, you can just make a rose petal honey. Rose petal honey is a delicious topping for bread, fruit, yogurt, ice cream, etc! This is great, I am going to make it and see if it helps my palpitations and tachycardia… how much of this do you take daily for that purpose??? this sounds divine. thank you! Kiva did not invent this recipe. It has been kicking around online since at least the late 90′s. I saw it in a library book too, that was published in the 70′s, but I forget the name of the book. You are the 4th person who has commented that Kiva did not invent this recipe. The other comments were incredibly nasty so I deleted them (I love having the ability to do that!) I know that Kiva didn’t invent it. Herbal remedies are not invented; they are shared. This was shared via Kiva Rose, so I credited it to her. I am not sure why some people seem to have a problem with this…other negative comments in this vein will be deleted, so there is no need to take time to write them! Thanks for your sweet post, Winnie! And you’re right, no one invents herbal remedies, it’s like traditional music and food recipes, we alter them and pass them on. My elixir recipes are certainly not proprietary, they are just a way of sharing my love of the plants and yummy tasting concoctions in an easy recipe format. Thanks again, Winnie, I really enjoy your blog! Elixirs have been “kicking around” since humans have had access to honey and alcohol, I expect. I’ve seen comments on many sites along the same lines…..seems that many people have gotten the impression that Kiva Rose is taking credit for inventing Rose Elixir, since you can find instructions for making it all over the internet that are called “Kiva’s Rose Elixir”. It seems to have pissed a lot of people off, as have other recipes that have her name attached to it. I don’t really understand why, myself. I have never seen anybody take issue with “Rosemary Gladstar’s Perfect Cream” recipe, even though she herself states the current recipe was gleamed from one of her student’s improvements on Rosemary’s original recipe. i’ve seen a bunch of trash talk on the net too about u. not so much about the elixir thing but more about a white girl using the term medicine woman whos married to a white guy calling himself a shaman. ive only mostly seen native people and some of the big name herbalists take offence but whatevs. keep doing what u do!!! Teo: this means that it will be ready to consume after 3-6 weeks. because there is alcohol it will keep for quite a long time.